Who knows how this Dead End sign on Kent Avenue, poignantly backed by a Stop sign, was undone. Truck. Construction. Vandalism. 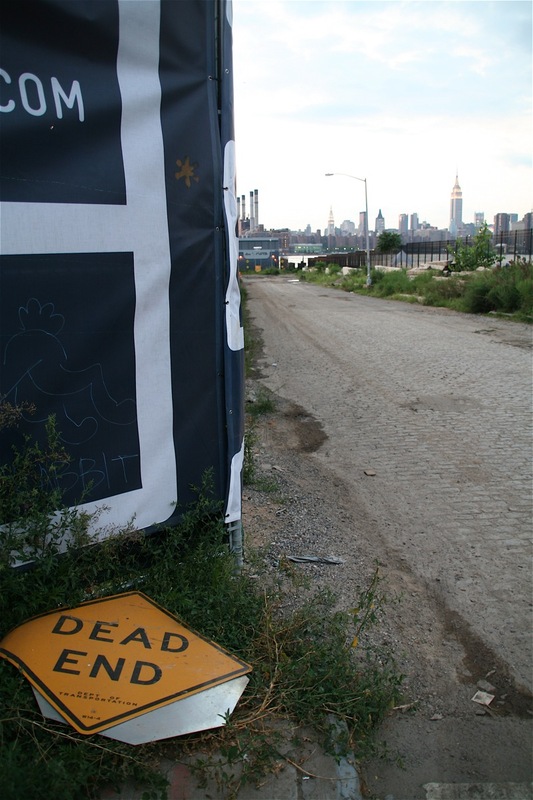 The pic was posted on flickr by Williamsburg blogger INSIJS, who emailed us the following description: "Both a Dead End and a Stop sign...they died together in tragic slumber like Romeo and Juliette, no post nor pole in sight." Who knew that compromised signage could be the source of such poetic inspiration? BONUS: This has nothing whatsoever to do with signs, but if you want to see some gorgeous photos of a New York City sunset from the Williamsburg side of the East River, check out INSIJS' East River Sunset flickr set.